When reviewing, it's easy to give high marks to things that have just come out. They're fresh and new, and the excitement of that can inflate their scores. Don't believe me? Just look at some of the movies Roger Ebert has given more than three stars to, and see how many of them have held up for more than a year. The same things happen to us as toy reviewers. 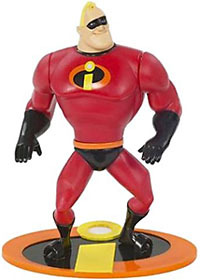 Last year the Disney Store exclusive Incredibles toys got really high marks, but how will they look a year later? Really damn good, that's how. Bob Parr used to be Mr. Incredible, one of the world's greatest crime fighters, saving lives and battling evil on a daily basis. Fifteen years later, he's been forced to adopt a civilian identity and retreat to the suburbs where he lives a "normal" life. Itching to get back into action, Bob gets his chance when a mysterious communication summons him to a remote island for a top secret assignment. You've just got to find his center of gravity. Mr. Incredible stands more than 7" tall, and moves at the neck, shoulders, biceps, elbows, wrists, waist, hips and knees. No, it's not a Marvel Legends level of articulation, but it is just as good as what we get from DC Direct. Heck, it's better. Given Bob's physique, it can be hard to get him to stand, but with those balljointed hips, rest assured that yes, he will stand, and he will stand securely. Beyond even the crappy action features and crummy articulation of the mass market figures, the sculpts were awful, too. The figures you could find at Wal*Mart or Toys R Us bore only a superficial resemblance to the characters in the movie. Yes, they looked like the drawings seen on other officially licensed products, but that's just it: the drawings of the Incredibles don't look like the renders of the Incredibles, the same way a line drawing wouldn't look like an oil painting. The angles are wrong, the shapes are off... it's a lot of tiny flaws that Hasbro picked up and put into their terrible toys. The Disney Store avoided all that, thankfully. If these figures aren't based off of the digital models, then the uncredited sculptors did a superb job of capturing the look of the film. Hasbro's Mr. 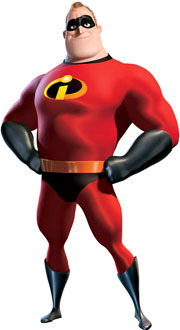 Incredible was completely ripped, like a comicbook superhero - only thing is, he never looked like that in the film. What he looked like was a guy who had been completely out of shape, got motivated and lost the paunch and put on a spandex super suit. It's the difference between the big, meaty guys who compete in those World's Strongest Man contests and the preening, posing bodybuilders who oil themselves up to flex. One's right, one's wrong, and Disney knew the difference. Bob's proportions don't line up to a real human, but they do match the cartoon, and that's what the toys are supposed to do. Paint apps are good. A lot of people have complained about the heavy rose wash on the figures' faces, and while it could definitely have been toned down, it doesn't ruin the toys. If they hadn't done that, we'd probably be hearing complaints that the faces were too flat. Such is life in the collector community. In any case, the blacks are glossy, to capture the look of leather, and the reds are nice and bright. There are no appreciable errors where the two colors meet, which is is all we ask. Press the I-logo on Bob's chest and it lights up for a few seconds, I guess in an effort to re-create the homing signal built into his suit. As far as action features go, this is pretty useless, but at least it doesn't get in the way of anything. Mr. Incredible doesn't have any accessories, which is a shame. Give Bob a claw torn from the Omnidroid and remove that silly light-up feature, and you'd have a real winner. 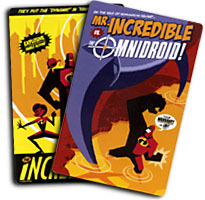 Included in the clamshell package is a translucent red Incredibles logo ring and two art deco cards that match the style of the movie's closing credits. 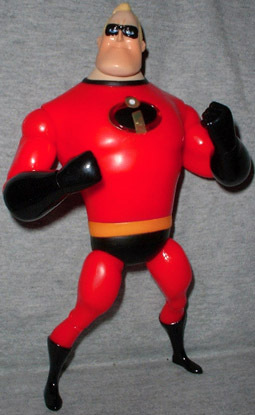 In nearly every way, the Disney Store Incredibles figures are miles better than the mass-market versions, and anyone who tells you differently is wrong. Better sculpt, better articulation, better size... there's no excuse for not buying these. The biggest drawback is the price, but the Disney Store has "buy one, get one" sales pretty frequently, so keep your eyes open and you can save big. Which imaginary hero invented for The Incredibles is your favorite? Tell us on our message board, the Loafing Lounge.